Backed: PIXEL. A seven-pound framed, open-source 32-LED grid-equipped display that presents Android-slung images over a mirror finish, PIXEL is the kind of MakerShed fare tech art project that brings us back to Kickstarter’s roots. PIXEL transfers images from an Android phone by Bluetooth and includes a proximity feature for delivering a map detailing the whereabouts of Snow White to those who approach it. With about 40 days left to go in the campaign, Kickstarter backers have seen the founders’ big picture, smashing through tiers of early-adopter rewards to contribute more than $30,000, nearly four times the initial $8,000 funding goal. 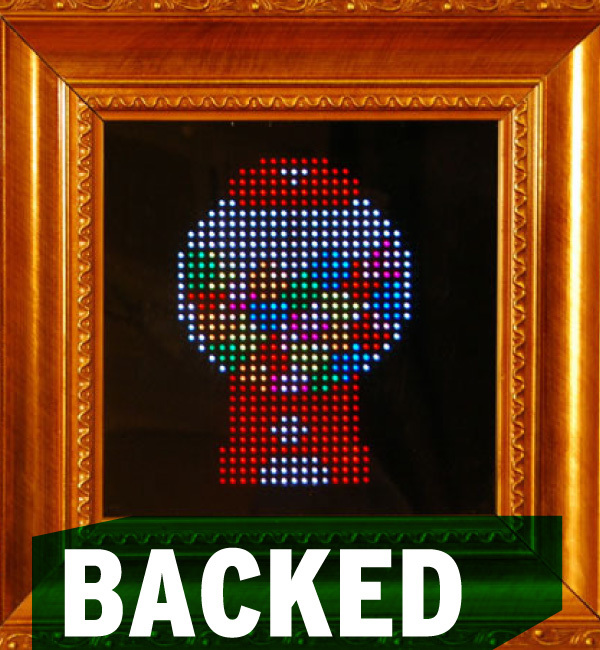 Those who seek Lite Brite-quality art for their walls can still get in on the first production run for $229, a modest discount from the final retail price. Backed: iLumi. Those who have seen the future know that it is illuminated by light bulbs capable of emitting lots of trippy lighting schemes. Frankly, iLumi didn’t have to be a very good product and probably would have made its meager $1,000 funding goal. 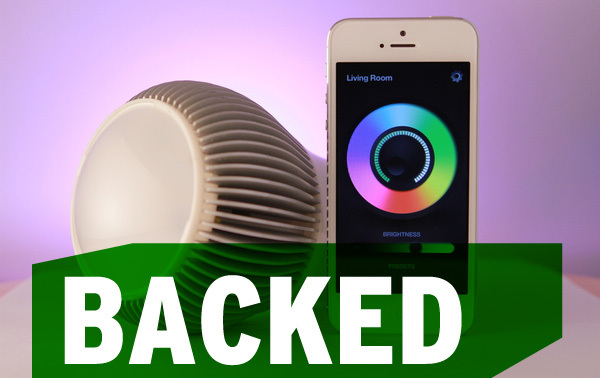 Indeed, at $15,303 raised with two weeks left to go, the campaign was a far cry from the more than a million dollars that last year’s Kickstarter phenom LIFX bagged in those dark days before Backed or Whacked. And even so, iLumi admitted this was its second time back at the till trying to get its multi-colored lighting source off the ground. Unlike LIFX, which is based on a hybrid of Wi-Fi and the Zigbee-friendly 802.15.4 mesh network, iLumi uses Bluetooth 4.0 to issue its spectrum-altering commands from your smartphone. Like the LIFX, it can sync your pulsing bulbs to a music track so you can be “Blinded by the Light” as you hear it. 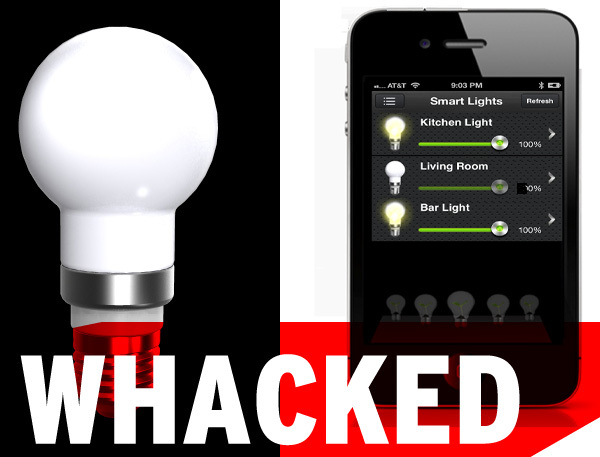 Whacked: RoboSmart. Alas, iLumi’s time to shine stood in contrast to another Indiegogo project that closed in late January, the RoboSmart, which raised only $4,107 of its $65,000 goal. Part of that Bluetooth bulb’s challenge may have been a lower wattage equivalent (40 watt) versus iLumi’s brighter alternative (100 watt). On the other hand, RoboSmart includes a proximity sensor, a more practical capability in a smart light bulb than music sync. The RoboSmart team has taken its campaign video private but should hold its head high. After all, it will collect more funds from its Flexible Funding campaign than iLumi would have had it only met its (second) funding goal. Whacked: Mauz. Billed as “one device to rule them all,” Mauz seeks “Tolkiens” of your affection to interact with a range of more sophisticated light-emitting devices, namely your PC and television. Affixing the little Mauz dongle to your iPhone turns it into a mouse that can be used with your Mac; rotate it 90 degrees and the surface becomes a multi-touch trackpad. But the real magic occurs when the iPhone leaves the surface where it can act as a gesture-driven motion controller. You can even leave it on your couch armrest and flip through content options by hovering and gesturing your hand over the phone. It’s all slick stuff, but the team hasn’t shared much about what exactly is in Mauz that enables the functionality since many smartphones already contain the gyroscopes and Bluetooth to control other peripherals. Indeed, the over-device hand navigation gestures are powered by user interface company Nanocritical, which demos those features working with a Mauz-free iPad. This Mauz, which backers would receive for $45, is having trouble collecting its cheese, though. With about 40 days to go, the campaign has cleared only about 10 percent of its $150,000 funding goal.